I’m a mom to three children, ages 7, 11 and 14. My kids have all expressed interest in sewing from time to time, since they see me sewing on a daily basis. And I have fond memories of sewing at an early age with my mom, so I feel that it’s important to give my kids those memories too, and teach them a valuable skill at the same time! Our school system no longer teaches Home Economics so I want to make sure I teach my children the basics, and my Girl Scout troop too! And no, I am not leaving the boys out, I taught my son’s Boy Scout troop to make drawstring bags with raw hide pulls and they loved it! 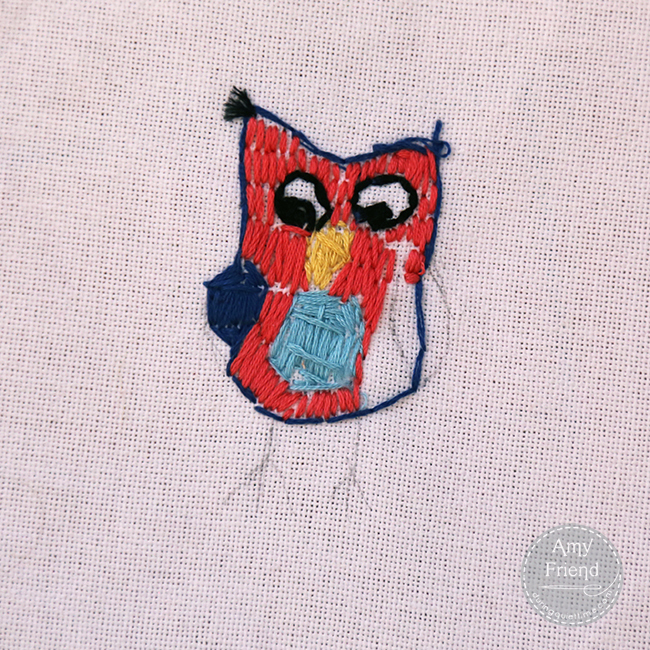 Teaching a child to sew can be approached as a gradual process. When my children were really little, age 3-5, they loved using lacing cards. 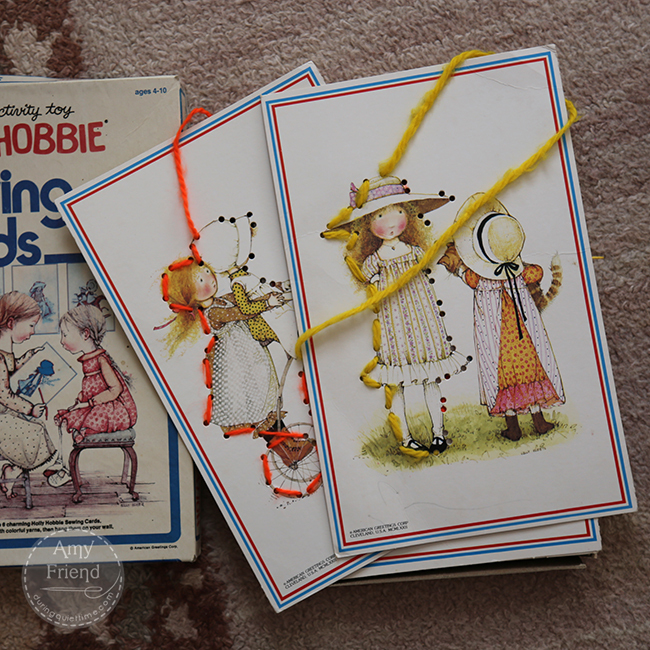 In fact, I still have my set of Holly Hobbie sewing cards from my childhood! The cards that they make now are a little more heavy duty but it’s the same general concept. These lacing cards teach a lot of important basic sewing skills—hand/eye coordination, the concept of pushing your needle up from the bottom and down through the top and not wrapping your lace around the edge of the board, the need to go in consecutive order from hole to hole, and the frustration of making a mistake and taking your stitches out. 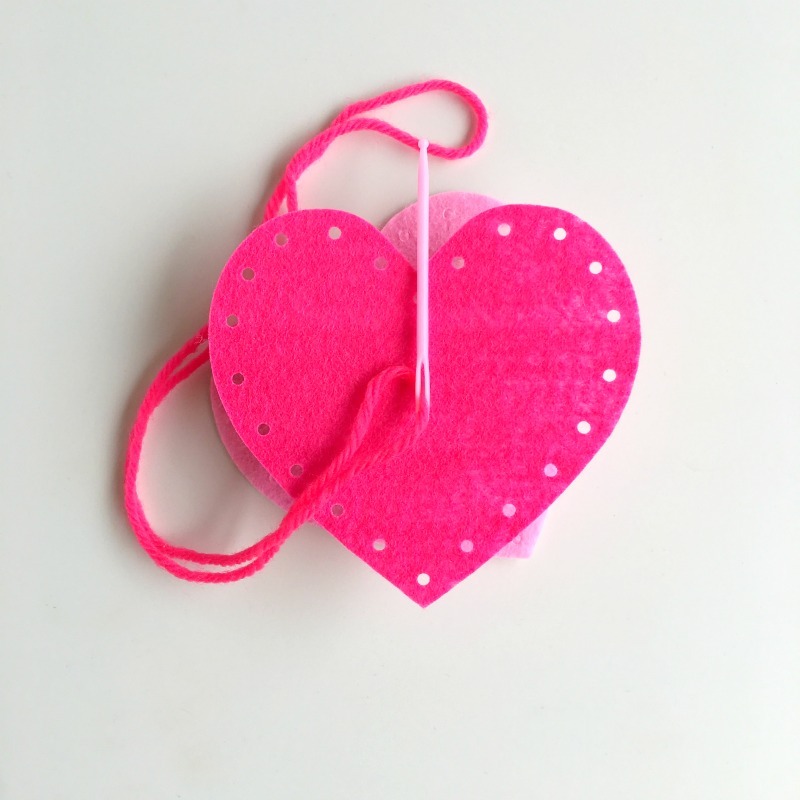 I keep these lacing cards in my sewing room as a natural way for the kids to sew with me. I say “keep” not “kept” because they are actually still there though my kids are a bit too old for them now! Another timeless favorite is sorting buttons from the button jar. It starts the love of sewing notions early, helps kids identify colors and they can group and sort. It also makes the sewing room fun. Heck, I still love sorting buttons. As the kids get a little older, it’s natural to move them to Aida cloth, an open weave fabric used for cross stitching, on a hoop. I taught my children some basic embroidery skills, and they just played. This way, the same lessons learned with the lacing cards were reinforced, but we added a little artistic freedom. Also, they learned to thread a needle and knot their thread. Moving from Aida cloth, to felt shapes with pre-made holes, was our next step. The kids learned to make simple hand-stitched ornaments and felt projects. You can buy pre-made kits with all the supplies that your kids will love. Here is an example of silly little felt monsters, and another with pretty headbands. 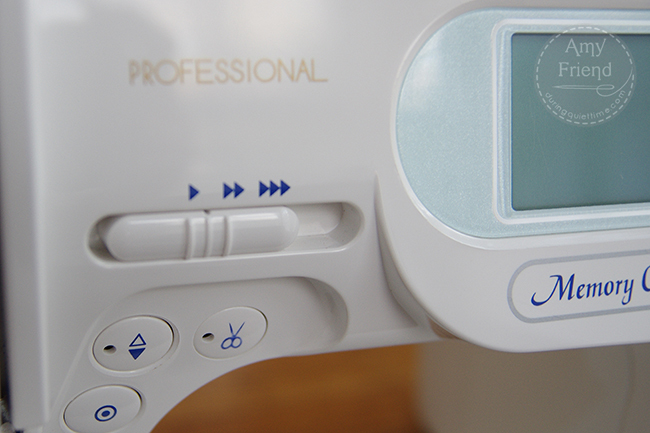 We then moved to the sewing machine. My son is my oldest, and we made a simple pillow together as his first project. In fact, I think his first machine sewing project was a pillow for his soon-to-be-born baby sister (who is now 7…he was in kindergarten at the time). Pillows make great first projects. Life got busier with three kids, and I didn’t machine sew with my middle child, Lily, until she was in second grade. At that time, I came up with a project that I pulled out of thin air as a bit of a bribe to get her to read the Little House on the Prairie series. She preferred fantasy books, but I loved those stories as a kid and wanted to introduce them to her. Once I suggested designing and sewing quilt blocks to accompany each Little House book in the series, she was in. It meant special mommy time and a chance to use the sewing machine—both of which she wanted. We had a great time reading, designing and sewing that quilt. We invited readers to sew along with us and they did! If you would like to join this free sew along, click HERE to visit the page with all the paper pieced blocks. It’s great fun to see other Little House quilts pop up all over social media. She was so proud of her finished quilt that she had me bring it into her third grade class the next year for show and tell. The town library also gave her the opportunity to hang it in the library for a month and her picture was in the local paper. She felt a lot of pride and a big sense of accomplishment. And, she learned a lot by the time we were done! Well, now my youngest daughter is in second grade so it’s time for me to start up the Little House on the Prairie sew along once again! 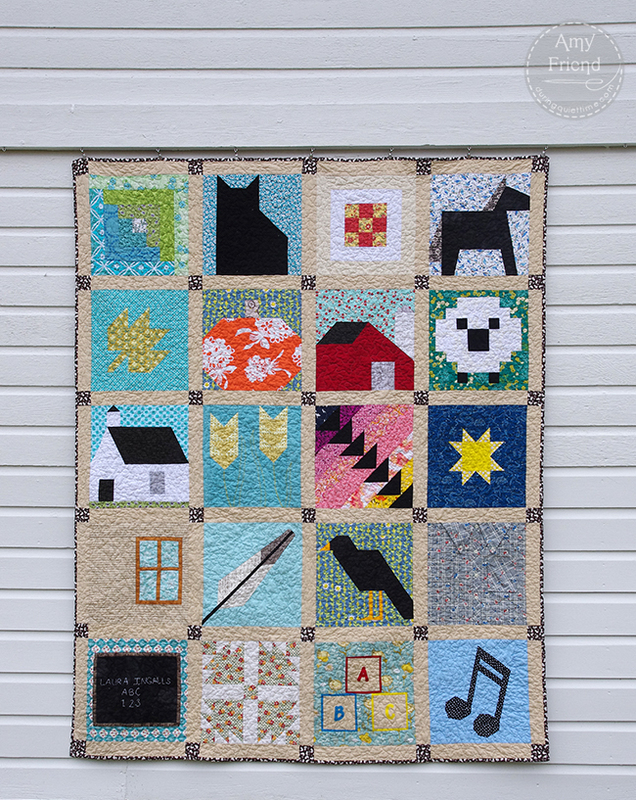 If you would like to join in on the Little House Sew Along, please click over to my site, During Quiettime, and follow along with the free block tutorials I have posted. You can also see Lilly and Penny’s interpretations, and the quilts they created. 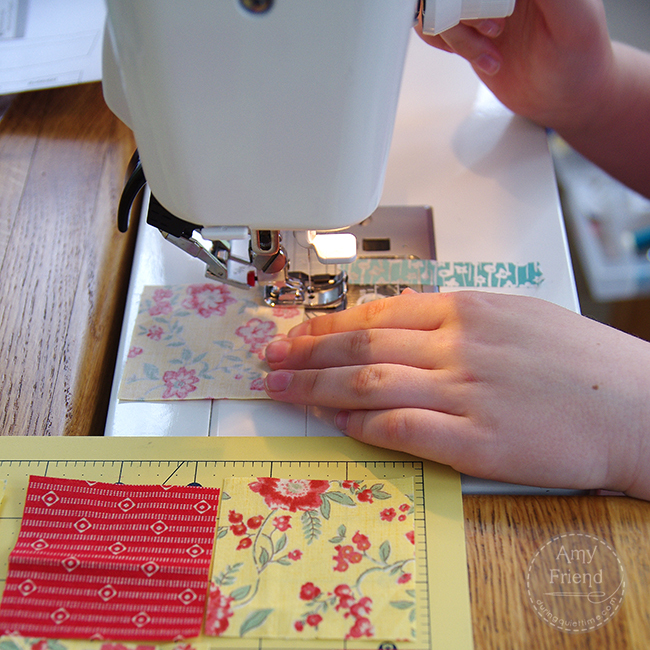 Frequent Problem: What to do If you Have More Than One Child Who Wants to Sew At A Time….. 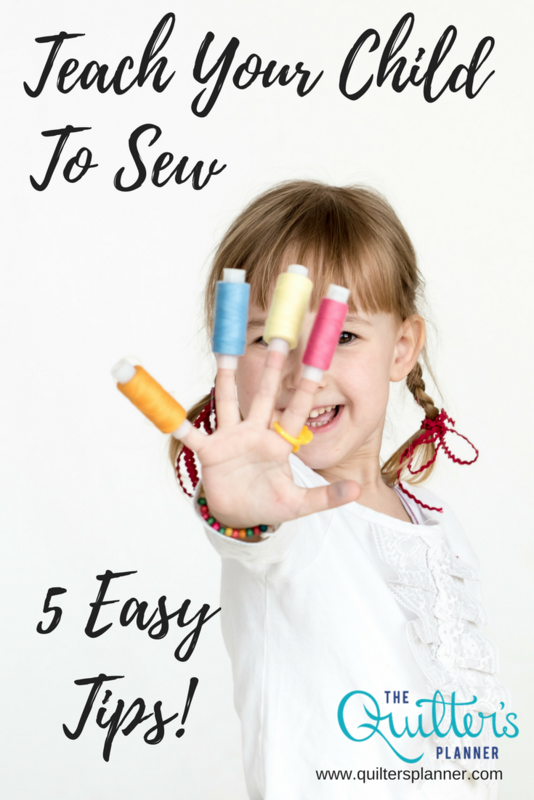 This begs the question, “how do you sew with just one child at a time if you have several little ones in your home?” It’s true, the second you try to sew with one child, they all want to sew. Stick with the rule of one machine sewing mommy/child project at a time. I know that’s all I have the space and patience to do at once! Need Supplies to Get Started Sewing With Your Kids? 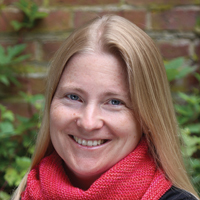 Amy is the author of Intentional Piecing, and she blogs at During Quiettime She is a master at paper piecing, teaches classes based on her patterns and is available for guild lectures. Amy is the designer of The Indie Vibrations Quilt Pattern in the 2017 Quilters Planner.